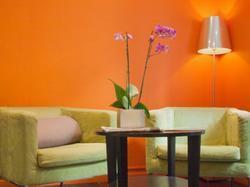 The Hotel Boissière welcomes you at the heart of Levallois-Perret, in one of its 46 rooms. Ideally located, next to Espace Champerret, Arc de Triomphe and the Porte Maillot, the hotel offers a direct access to the center of Paris. Recently renovated, the rooms are all equipped with free high speed internet connection and a flat screen television. You will definitely enjoy our buffet breakfast with the bread freshly prepared everyday by the close-by bakery and served under the covered veranda. The best way to start your day! We will do our best to make you enjoy your stay at the Hotel Boissière!